The Kentucky Tree Climbing Championship (KAA TCC) is an annual event designed to test the professional skills of Kentucky’s working arborists. The KAA TCC is an exciting, competitive event that promotes safe working practices, demonstrates improvements and innovations in techniques and equipment, and provides industry recognition to the general public. It also serves as a forum for climbers, professionals, and the public to gather and exchange ideas with one another. The KAA TCC showcases the talents of Kentucky’s best climbers as they compete for the title of state champion by participating in six different preliminary events (described below) that highlight the skills of tree care workers. Each event tests a competitor's ability to quickly, professionally, and safely perform work-related tree-care tasks. Competitors with the highest scores during the preliminary events move on to compete in a final event called the Masters' Challenge. The Masters' Challenge winner is named the champion, and then goes on to represent Kentucky at the International Tree Climbing Championship. 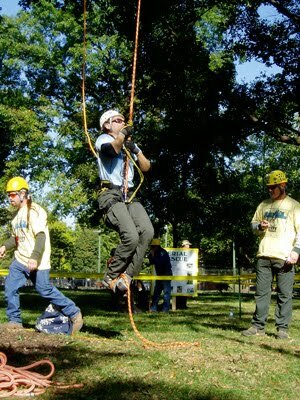 The KAA TCC is an event attended by professional tree climbers from all over the Mid West, Southeast, and beyond. It is an excellent networking opportunity for a wide array of arborists dedicated to the advancement of arboriculture as a profession. Sponsorship of the KAA TCC is a great way to reach those influential professionals. Anyone interested in supporting the KAA TCC with sponsorship help should contact the KAA for more information. The Work Climb tests the contestant’s ability to move about the tree using a tree-climbing rope and saddle/harness. The event setup is the same for both male and female contestants. Each contestant starts from a staging area in the tree and is required to visit five work stations throughout the tree, performing a specified task at each station. Each station in the tree is equipped with a bell; the contestant must ring the bell (or sound the horn) before continuing to the next station. Contestants earn points for successfully completing the task at each station and ringing the bell with either a handsaw, pole pruner, or hand as indicated. The Aerial Rescue event is a timed event that tests the contestant’s ability to climb to and safely lower a climber who is unable to descend without assistance. The event setup is the same for male and female contestants. Throwline is a timed event that tests the contestant’s ability to accurately place a throwline and climbing line in a tree at heights between approximately 30 and 65 feet. Contestants attempt to toss a throwline through two of eight targets. Targets can be located in a single tree, four on each side; or in multiple trees as long as there are two distinct sets of four targets. The targets are worth 10, 7, 5, and 3 points, respectively, depending on the difficulty of the throw. Each contestant is allowed unlimited throws within 6 minutes, but a contestant can score in only one target on each side of the tree. The Speed Climb tests the contestant’s ability to climb a predetermined route from the ground to about 60 feet up a tree with a belayed climbing system for safety. The event is timed, and the contestant who reaches and rings the final bell of the course, in the least amount of time wins. There could be more than one bell placed in the tree to determine the route; in such an event, the climber must ring all the bells in order to complete the event. The Secured Footlock measures the contestant’s ability to perform a vertical ascent into a tree using a Prusik hitch or other approved friction hitch for fall protection and the footlock rope-climbing method on a doubled climbing line. The heights are 50 feet for the men’s event and 40 feet for the women’s event. Mechanical ascenders may not be used. The event is timed, with a maximum time limit of 60 seconds, and the contestant with the fastest time wins.